The Saint's greatness was rooted in his upbringing, which was strict even by the standards of nineteenth-century Russia. His father, a priest, kept all secular influences out of the home, nor were the children allowed to wander outside the surrounding hedgerow which marked the boundaries of their world. But the apparent harshness of this monastic like environment was dissolved in an atmosphere of true Christian love, and the social isolation was frequently broken by the glad reception of poor folk and pilgrims. The lack of distractions and the training in prayer and spiritual struggle disposed the mind to concentrate, so that the children's delayed education proved no intellectual disadvantage and served to benefit their spiritual welfare--which was their parents' main concern. Even after such concentrated religious nurturing, it needed the intervention of Divine Providence to steer young Benjamin Preobrazhensky--the future Bishop Basil--onto the path of God's will. He had enrolled in an English university to prepare for his chosen career in writing when, during a summer holiday, he went sailing with friends on the Volga. The boat capsized and, in danger of drowning, Benjamin prayed desperately, promising that if he were saved he would dedicate his life to defending the Faith. He was the only survivor. Nor did he neglect the children. When, in 1918, the Bolsheviks issued a decree forbidding the teaching of catechism in the schools, Benjamin gathered the children in church, where he himself continued their lessons in the Law of God. His father considered it premature to ordain or tonsure before the age of forty, and only at the age of forty-five did Benjamin become a priest. He was tonsured soon afterwards and the following year, 1921, he was consecrated Bishop of Kineshma. As a hierarch, Bishop Basil remained lovingly simple in his relations with people. "When he visited the prayer circles, word of his arrival spread quickly and people hurried to meet him....Those who arrived sat wherever they could. Vladika would settle himself on the floor and sing religious songs, accompanying himself on the zither. There was so much love and simplicity in his sermons, Gospel talks and singing that he seemed like an instrument in the hands of God. He neither looked for, nor desired another lot in life; other lot in life: neither gold nor silver nor position in the world; he wanted none of it. He wanted only lo be a true servant of God." An absence of personal ambition and self concern provided ample room for the Holy Spirit, whose presence was clearly communicated through the Bishop's sermons and his celebration of the divine services. Crowds of people, many of them uneducated workers, walked several miles to attend the Thursday evening vigils at which Vladika read the akathist in honor of the Lord's Sufferings. "During the reading it was so silent in the church that it seemed as if no one was there; every word being heard in the farthest corner....So abundant was the grace at these services that the people felt no weariness.'' Even non-believers, Jews, experienced the transforming power of the Bishop's sermons, which almost everyone felt "answered the inner questions of the soul." Vladika's spiritual greatness was fortified by his asceticism. He lived in a bath house located in a pious widow's back yard, where he slept on the floor using a log for a pillow. Although this meant daily walking clear across the city to the cathedral, he would not be persuaded to move. Walking the streets in the early morning or late night hours, the bishop was accosted several times by robbers. Having long since dispensed with all belongings, he gave them whatever he had, and was able to do so meekly and with love,. His ascetic labors bore fruit in the healing power of his prayers. "Once a girl knocked at Vladika's door. He recognized her as one of the children who came to him for catechism. She had been weeping bitterly the whole way, and when she saw Vladika, her last hope, she wept still more. How could she not cry when her father, whom she loved dearly, was dying? Vladika immediately gathered his things and went with her to the dying man, whom he found in death's grip. The Bishop began to pray. He prayed long and fervently. He then communicated the dying man and, turning everything over to the will of God, left. Immediately the illness began to subside. The sick man began to recover quickly and was soon well." Numerous cases likewise gave evidence of his gift of clairvoyance. The greatest challenge of the Saint's ministry was to steer his flock safely through the storms which struck the internal affairs of the Russian Church. When, in the early 20s, the government sanctioned Renovationists began seizing churches and implanting their modernist teachings, Bishop Basil instructed his clergy not to leave thier flocks but to serve outside in the open air, as he himself did, attracting thousands with his inspired sermons. 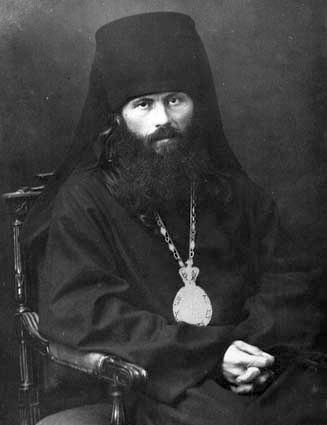 This resistance led to his first arrest, in 1923, and exile to Ziransk in the company of five other hierarchs, among whom was Metropolitan Cyril of Kazan, a future leader of the Catacomb Church. His term of exile completed, Bishop Basil returned to Kineshma in May 1925. But his enormous popularity irritated the authorities, and within a year he was forced to leave the city. He secluded himself in the country, devoting all his time to prayer. Six months later he returned to Kineshma to resume his pastoral and apostolic activity, nurturing his spiritual children and revitalizing church life. But it was only a matter of months before he was compelled once again to move. It was a familiar pattern, which marked the lives of many uncompromising priests and hierarchs: arrest, imprisonment and exile alternated with periods of relative freedom. As much as they wanted to, the authorities found no grounds to sentence Vladika to a prolonged term; he was apolitical and concentrated on purely spiritual matters. This changed with the publication in 1927 of Metropolitan Sergius' Declaration, which essentially legitimized state interference in the internal life of the Church. It opened wide the doors to persecution of Orthodox bishops, clergy and laity on a massive scale. In 1928 Bishop Basil was arrested and exiled to three years in a remote village of Sverdlovsk province. His thorough detachment from worldly affairs and worldly possessions gave him a wonderful flexibility, and whatever his circumstances Vladika managed to profit. He lived in exile as if he were a desert hermit, taking advantage of the isolation to immerse himself in spiritual life. And he would have been quite content to remain there, but he was not allowed. His term of exile completed, Vladika settled in the city of Orel. Two years later the NKVD again forced him to move, and he returned to Kineshma. "How do you relate to the Soviet government?" "As a civil power," replied the bishop, "I acknowledge it, but its interference in the affairs of the Church, and the disorder that it has caused, unprecedented in the history of the world, I do not agree with." The interrogators demanded that he recognize the Declaration of Metropolitan Sergius. When Vladika refused, "the infuriated inquisitors threw themselves at him and beat him, using the buckle ends of military belts. This in no way changed his decision to confess Christ in Orthodox purity. He had no intention of spoiling his confession of Christ by attempting to please the world." In 1942, the Bishop of Yaroslav wrote, asking Bishop Basil to accept a diocese. Again, this meant acknowledging Metropolitan Sergius and his Declaration. "I do not recognize Sergius as Orthodox," the Saint replied. "I ask that you no longer offer me dioceses in' the future. I am old and worn out from exile.'' Within three months he was again arrested. Another five-year sentence sent him to exile in the Siberian forests of Krasnoyarsk province. Here the cycle ended. By this time Vladika's health was broken; he was partially paralyzed and needed someone to help care for him. A final attempt to bend his will towards compromise targeted his physical weakness. "Recognize [Sergius'] Synod," he was told, "and we will immediately free you; we will send you by plane to Moscow where they will give you medical attention and you will live." Vladika refused. "Stay where you are then, we cannot release you" --lines which, stripped of the modern idiom, could have been taken straight from any early Christian martyrology. "....My child, be not troubled, everything happens according to God's will. I have reached the limit of human life, seventy years. Further life holds little interest for me. One thing is certain, I will not be able to endure five years more under these conditions....The most Precious Medicine I received on Great Thursday. I give thanks to the Creator for all Joys and Comforts. A cough is suffocating me. I cannot breathe. Most of the time I lie down, although too much rest is not good either....Farewell my child. I'm weary of writing. Don't be depressed. Stay well. Trust God completely. Bow your head and say, “Thy will be done." Pray. I have faith in a child's prayer; it frequently helps me. Look for comfort in prayer. I wish you health, a long and happy life. With sincere love, Bishop Basil of Kineshma. P.S. Regards to the children and best wishes. I prostrate myself before you and ask your forgiveness. He died a few months later, on July 29 (O.S. ), 1945. Icon of hiero-confessor Basil, south wall of the Altar sacristy.